Discover an underwater world. Raise an army. Multiply your victories. Do whatever it takes to become the Ace of Seafood. 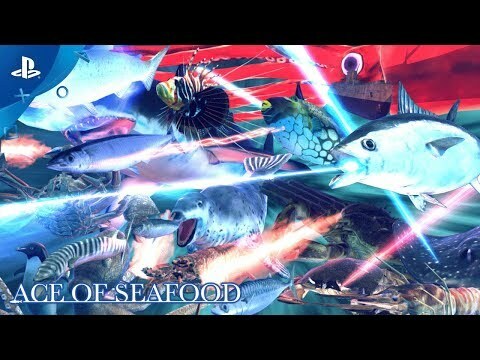 Ace of Seafood is an open-world third-party action shooting game set in the vast ocean, developed by Nussoft. In this world, sea creatures possess the ability to shoot powerful lasers that can destroy just about anything. Organize up to six members of fish or crabs in your party. Defeat enemies, collect followers, train yourself and secure reefs. Expand your fighting power by fighting various other creatures while exploring the vast underwater world. Take control of an array of sea creatures and freely explore the ocean in an open-world map. You will engage in battle with various forms of sea-life in order to capture and take control of the reefs they guard. The reefs serve as bases from which you can strengthen your allies and breed more of them. As you multiply your victories, you will be able to control a stronger force and explore a wider region. In battle, your allies will follow the commands of the Ace (that's you) which include battle formation and special abilities. In this adventure, you can be a sardine, crab or giant squid. Let’s fight in the vast ocean, get more genes and aim for the strongest creature in the ocean: THE ACE OF SEAFOOD! A large variety of species and locations to discover and conquer. Collect DNA from enemies you defeat to breed your own fish for your armies. Control the ocean through strategy, battle and seafood. What's Better Than One Fish? Six Fish! Build parties of 6 fish/crustaceans. Each creature comes with unique skills and attacks, build your fishy army by defeating enemies and strategically organising your party members. Command your forces and lead them to victory. Freely explore the open world with your array of sea creatures. Engage in battles with various forms of sea-life in order to capture and take control of the reefs they guard. Online multiplayer lets you bringing friends to join you in exploring and conquering the ocean. Use voice chat to command and enjoy your own seafood party. Not only is online multiplayer supported, but split screen allows for local play too. ©Nussoft. All Rights Reserved. ©Active Gaming Media Inc. All Rights Reserved.